Back In The Gi » Blog Archive » Kata as a training method for self-defence. 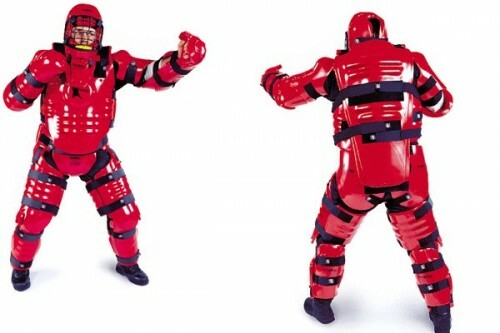 Kata as a training method for self-defence. Rory Miller is a martial artist, self-defense instructor, and corrections officer who has seen far more than his fair share of real-world violence. He is the author of the book Meditations on Violence: A Comparison of Martial Arts Training & Real World Violence, which I cannot recommend highly enough. Given that Miller’s focus is on what works and what doesn’t in real combat, you may find it surprising to read his thoughts on basics and kata as methods of training. Certainly, there are many (mostly junior) students of karate who feel that walking basics or kata are done primailry for historical reasons, whereas sparring (kumite) is the “real deal” when it comes to training to fight. Interestingly, Sgt. Miller’s take is the opposite. Because they are dynamic and because we know that fights are dynamic, there is a tendency to use sparring as a reality check. Since most people have learned about physical conflict by watching entertaining shows (whether professional sports, movies, or “reality TV,” it is entertainment), or from class, and since sparring looks more like this image than, say, basics or line drills, they intuitively believe it is more “real.” It isn’t. A real fight for your life is NOTHING like sparring. Properly trained, static drills can be very good for picking up the skills of violence. By removing the opponent, you can strike with full power, speed, intent, and savagery. These drills, unlike others, do not create bad habits, provided the instructor knows what he is teaching. Properly trained, the student can perform any action correctly — but the absence of chaos during practice often leads to the student freezing when presented with chaos. Miller is clearly not arguing that basics are sufficient for learning how to fight. However, he is saying that sparring is not the way to make up the difference and in fact that sparring will be counterproductive in this regard. Kumite is not chaos either. First, there are two distinct types of kata in the Japanese tradition. 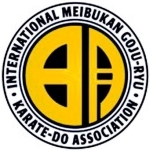 Most martial arts are familiar with the solo kata of Karate. In these kata, the kareteka goes through a series of predetermined moves. Two-man kata are common in the older styles of Japanese martial arts [note: I would include renzoku kumite and kakomi kumite in this category – RG]. In these, two practitioners act on each other in a scripted fashion. [There are] inherent flaws in scripted drills, but these training methods did not survive for hundreds of years because they sucked. Here, I want to point out some of the advantages. Solo kata. Understand that I have only dabbled in Karate, though my wife is a practitioner. Occasionally, I would have an encounter, often an intense one, and later see the action in my wife’s Karate kata. One time, I was the only officer on the booking floor on a night shift. I heard a sound coming from one of our group holding rooms and I slid the window cover open. I saw one fresh arrestee slamming kicks into another who was laying on the ground. I called for back-up and keyed the door open. Procedure would have been to wait for back-up but in my estimation, the kid on the ground was about to be kicked to death. I reached in, grabbed the kicker by the hood, yanked him out of the room, and slammed him against the wall outside. I applied cuffs without a problem; he was stunned by the speed. When I started doing the report, I found out that he had been a state champion wrestler a few years before. The body mechanics looked like a basic kata. The reach and grab looked like a lunge punch. 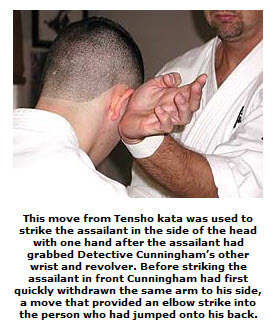 In the kata, this is followed by a ninety-degree turn and an outside block with the punching hand. I had his hood in that hand, so it pulled him off-balance, forward, head almost to my hip, and spun him up to face away from me. The next move in kata is a reverse punch with the other hand. In real life, my palm slammed and pinned him against the wall. It was effective. The body mechanics were identical to kata. Not a single move was the way any Karate instructore had ever explained it to me. I am not saying that kata is the optimal or even a good way to train. What I am saying is that from my experience, the mechanics of Karate kata are extremely functional in real life. To me, it looks like kata is all about hands, shoulders, and hips working together simultaneously with a drop in center of gravity (COG). This is one of the most potent systems of power generation. This is a potent system regardless of whether the action is interpreted as a strike, a lock, or a throw. The more possibilities you see in anything, the more options you have. Since the actions can be interpreted effectively in so many ways, kata may be more powerful as a training tool if you see none of those (or all of them) than if you decide it is just one of them. As long as the hips, hands, shoulders, and COG work together, there is no difference anyway. Karateka get in their own way when they try to dig into the “deeper secrets” of their movement. Learn to move. Kata is excellent for that. Then reproduce or experience the dynamics of actual conflict and you will see how much really valid technique there is in the old forms. You may recall from a previous post that Sgt. Miller is critical of unrealistic techniques that are inapplicable in the sorts of situations in which one may be attacked for real. As he put it, “Will your favorite move still work without room to turn or step?”. If you are used to free sparring, then you have trained yourself to need a lot of room to maneuver, which is another reason that sparring is unrealistic or even counterproductive. OK, so it’s three against one, how not to get killed? Undercover time is now over, you’re a police officer and your cover is blown. What I remember, I’ll try to explain as best as I can. The woman on my back was suddenly off my back and screaming, running out of the building. As for the guy who grabbed my revolver, I remember striking him twice with my left hand (a move from Tensho kata where the practitioner hits forward and down with his palm heel from a high chamber position) into the ear location, which forced him to release the grip he had on the revolver and drop to his knees (this was the move that saved my life). My final thought is that if I had not been trained properly in the martial arts and the bunkai of Tensho kata (and other kata too), this situation would have ended differently. The main attack was with the guy who grabbed my weapon and if I had not trained both sides of my hands to hit equally (using the palm heel strike) he could have pulled my revolver away from me and I would not have been able to write this article. There are many things in the martial arts that seem counterintuitive. If they weren’t, it wouldn’t take so much training to make them feel natural, as eventually they do in advanced students. One of the counterintuitive aspects is the fact that kata — which are done alone, are highly scripted, and do not automatically reveal the purposes of the movements — can be a much more effective method of training for real-world conflict than free sparring with a real opponent.